Oh, it would be years ago now, but at one time a minister lived with his small daughter in a town up north near the Sabbanock River, up where the river is narrow and the winters used to be especially long. The minister’s name was Tyler Caskey, and for quite some while his story was told in towns up and down the river, and as far over as the coast, until it emerged with enough variations so as to lose its original punch, and just the passing of time, of course, will affect the vigor of these things. But there are a few people still living in the town of West Annett who are said to remember quite clearly the events that took place during the wintry, final months of 1959. And if you inquire with enough patience and restraint of curiosity, you can probably get them to tell you what it is they claim to know, although its accuracy might be something you’d have to sort out on your own. We do know the Reverend Tyler Caskey had two daughters at the time, but the littler one, really just a toddler then, lived with Tyler’s mother a few hours away, farther down the river in a town called Shirley Falls, where the river got wide and the roadways and buildings more frequent and substantial, things taking on a more serious tone than what you might find up near the town of West Annett. Up there, you could drive for miles—and still can—on twisting back roads, not passing by anything more than the occasional farmhouse, acres of fields and woods all around. In one of these farmhouses, the minister and his little girl Katherine lived. The place was at least a hundred years old, built and farmed for decades by the family of Joshua Locke. But by the end of the Depression, when the farmers had no money to pay for hired hands, the farm had fallen into disrepair. Their blacksmith business, started before the First World War, also dwindled away to nothing. Eventually the house was occupied, and remained so for years, by the sole inheritor, Carl Locke, a man who seldom came into town, and who, when called upon to pull open his door, did so holding a rifle. But in the end he had left the entire place—house, barn, and a few acres of fields—to the Congregational church, even though no one seemed to remember him being inside the church more than twice in his life. At any rate, West Annett, even containing as it did the three white buildings of Annett Academy, was a fairly small town; its church coffers were small as well. When Reverend Smith, the minister who had been there for years and years, finally got around to retiring, hauling his deaf wife with him off to South Carolina, where apparently some nephew waited to look after their needs, the church board waved them good-bye with a tepid farewell, then turned around enthusiastically and made a very nice real estate deal. The parsonage on Main Street was sold to the local dentist, and the new minister would be housed at the Locke place, out there on Stepping Stone Road. The Pulpit Committee had made their recommendation of Tyler Caskey with this in mind, counting on his youth, his big-boned, agreeable nature, and the discomfort he had shown right away in discussing matters of money, to prevent him from complaining about being housed in a field two miles from town; and on all these points they were right. The minister, in the six years he had lived there now, had never once complained, and except for permission to paint the living room and dining room pink, had never asked the church for anything. Which is partly why the house remained a bit ramshackle, inside and out. It had a broken porch railing and tilting front steps. But it offered those pleasing lines you find in old houses sometimes; a tall two-story, with generous windows and a nice slope to the roof. And if you studied the place for a moment—the southern exposure it got on the side, the way the mudroom faced north—you realized the people who built it years before had possessed a fine sense of what they were doing; there was a symmetry here that was unadorned, kind to the eye. So begin with a day in early October, when it’s easy to think of the sun shining hard, the fields surrounding the minister’s house brown and gold, the trees on the hills sparkling a yellowy-red. There was—there always is—plenty to worry about. The Russians had sent up their Sputnik satellites two years before—one whirling around right now with that poor dead dog inside—and were said to be spying on us from outer space, as well as right here in our own country. Nikita Khrushchev, squatty and remarkably unattractive, had even arrived a couple of weeks before for a visit to America, whether people liked it or not—and many did not; they were afraid he’d be killed before getting home, and then what horrors might ensue! Experts, whoever they were, and however they did it, had determined that a guided missile from Moscow to New York would fall within 7.3 miles of its target, and while it was a comfort to live outside this radius, there were three families in West Annett who had bomb shelters in their backyards anyway, because after all, you never knew. Still: This happened to be the first year in many where countrywide church membership had not increased at a greater rate than the general population, and that, if you thought about it, had to mean something. Possibly it meant people were not panicking. Possibly it meant people wanted to believe, and were apparently believing—particularly here in the northern reaches of New England, where the same people had lived for years, not many communists among them (although there were a few)—that after half a century of colossal human horror, the world really could perhaps be finally decent, and safe, and good. And today—the one we’ve chosen to start with—was lovely in its sunny brightness, the tops of those distant trees a brave and brilliant yellowy-red. Even keeping in mind how this kind of autumn day can be an awful thing, harsh and sharp as broken glass, the sky so blue it could break down the middle, the day was perfectly beautiful, too. The kind of day where you could easily imagine the tall minister out for a walk, thinking, I will lift up mine eyes unto the hills. It had, in fact, been Reverend Caskey’s habit that fall to take a morning walk down Stepping Stone Road, then turn back up around Ringrose Pond, and there were some mornings when he continued on into town, headed to his study in the basement of the church, waving to people along the way who tapped their horns, or stopping to talk to a car that pulled over, leaning his large body down to peer into the window, smiling, nodding, his hand lingering on the car door until the window was rolled up, a wave good-bye. This morning the man was sitting in his study at home, tapping a pen against the top of his desk. Right after breakfast, he had received a telephone call from his daughter’s school. His daughter’s teacher was a young woman named Mrs. Ingersoll, and she had asked the minister in a remarkably clear voice—though it was somewhat too high-pitched for his taste—if he would come to school in the late afternoon to discuss Katherine’s behavior. A small, stinging pain below his collarbone arrived, and, placing his hand over it, the man had the odd momentary sense of someone about to say the Pledge of Allegiance. Then for some minutes he walked back and forth in front of his desk, his fingers tapping his mouth. Nobody, of course, wants to start a morning this way, but it was especially true for Reverend Caskey, who had suffered his share of recent sorrows, and while people were aware of this, the man was really far more worn down than anyone knew. the minister’s study in the old farmhouse had been for many years the bedroom of Carl Locke. It was a large room on the first floor, with a view of what must have been, at one time, a very nice side garden. An old birdbath still stood in the center of a circular design of now mostly broken bricks, and vines grew over a tilting trellis, beyond which could be seen part of a meadow and an old stone wall that wobbled its way out of sight. While Tyler Caskey had heard stories of the cantankerous and, some said, filthy old man who had lived here before him, while his wife had even complained for months when they first moved in that she could, in this room on a warm day, detect the smell of urine, the truth is that Tyler liked the room very much. He liked the view; he’d even come to feel some affinity to the old man himself. And now Tyler thought he wouldn’t go for his morning walk; he’d sit right here where another fellow had struggled apparently with righteousness, and probably loneliness, too. There was a sermon to prepare. There always was; and the one for this Sunday the minister was going to call “On the Perils of Personal Vanity.” A tricky topic, requiring discretion—what specifics would he use?—particularly as he was hoping with its teaching to head off a crisis that loomed on the ecclesiastical horizon here in West Annett regarding the purchase of a new organ. You can be sure that in a small town where there is only one church, the decision as to whether or not that church needs a new organ can take on some significance; the organist, Doris Austin, was ready to view any opposition to the purchase as an assault upon her character—a stance irritating to those who had a natural hesitancy toward any change. So with not much else to occupy itself at the time, the town was on the verge of being occupied by this. Reverend Caskey was opposed to the organ, but said nothing publicly, only tried through his preaching to make people think. Last week had been World Communion Sunday, and the minister had emphasized this point to his congregation right before the special offering. They were Christians in communion with the world. As was tradition, on the Friday before World Communion Sunday, a noontime service of the Ladies’ Aid Benevolent Society had been held, and that’s when the minister had been hoping to speak on the Perils of Personal Vanity, guiding this group of women—responsible for raising much of the church’s money—away from any frivolous expenditures. (Jane Watson wanted a new set of linen tablecloths for coffee hour.) But he’d not been able to gather his thoughts, and for Tyler, who used to like to picture himself, metaphorically speaking, as taking his listeners gently by the scruff of their white New England necks—Listen while I tell you—his Friday performance had been disappointing; he’d provided only general words of praise, for hard work, money raised. This morning Tyler Caskey was trying again to compose some lines about vanity. He had jotted down notes from 12 Ecclesiastes on the apparent meaninglessness of life when viewed from the human perspective “under the sun.” “Under the sun, all is vanity and vexation of spirit,” he had written. He tapped the pen, and did not write down the business of viewing from “above the sun,” which would show life to be a gift from the hand of God. No, he just sat, staring out the window of the room. His eyes, wide and gazing, did not take in the birdbath, or the stone wall, or anything at all; he was just staring into space with his blue eyes. Little wispy thises and thats were floating by the edge of his memory—the poster that had hung in his childhood bedroom with the words a good boy never talks back, picnic tables in the Applebys’ field, where the bean-hole suppers used to be held, the maroon drapes in the living room of the house where his mother still lived, now with the baby, Jeannie—and here his mind hovered: the proprietary nature of his mother’s large hands as she guided the child’s little shoulders through the living room. didn’t have to be phrased anymore. Everyone knew where the baby was, and no one, to his knowledge, frowned on the arrangement. And in fact, no one really did. Fathers were not, at that time, expected to raise small babies alone, particularly where there was so little money, and while the Ladies’ Aid had supplied him with the light housekeeping duties of Mrs. Connie Hatch (she was paid pennies), his congregation understood the baby was better off for the time being with her Grandmother Caskey—who had never, by the way, offered to take in little Katherine, too. Cross to bear—words that shot through his mind now, and made him grimace, for she was not his cross to bear. She was his gift from God. He sat up straight and tried to picture himself talking with the young teacher, how he would listen earnestly, hands clasping his knees. But his cuffs were frayed. How could he not have noticed? Examining the cuffs more closely, he realized the shirt was simply old, had reached the point where his wife would have taken it for herself, cutting the sleeves off midway and wearing it with her bright pink ballet tights that had no feet. 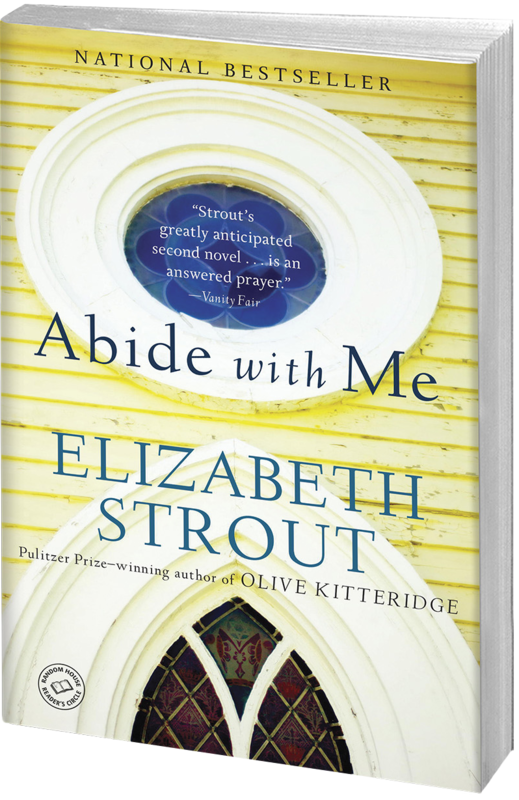 Excerpted from Abide with Me by Elizabeth Strout. Copyright © 2006 by Elizabeth Strout. Excerpted by permission of Random House Trade Paperbacks, a division of Random House LLC. All rights reserved. No part of this excerpt may be reproduced or reprinted without permission in writing from the publisher.